The fingerboarding community is an extension of traditional skateboarding. Fingerboarding has grown in mass popularity and is a lifestyle to many since the early 90s. To unite the communities of skateboarding, fingerboarding and art. Binded and inspired by the history and culture of bowl riding, and to present a unique expression of this root of the skate culture, Exhibit A Gallery is holding an art exhibition on November 30, 2013 titled “A BOMB IN A BOWL” The Art of Bombed Miniature Concrete Skate Bowls. From the late 1970′s one man’s drought is another man’s blessing, the skate “Bowl” is born. In Southern California, hundreds maybe thousands of empty swimming pools laid to waste. A baron wasteland, overgrown backyards of dried up or algae infested pools. Skateboarders and graffiti artists would descend like vultures on dying carcasses to leave their mark. The lines of the urethane wheels or the spray painted abominations were left behind as scars of remembrance. After the recession and drought, pools would be renovated and filled. A return to the laughter of children and their families in their backyard oasis. But many of these concrete monuments would meet a formidable demise to demolition, to many they were an eye sore that only an Artist could appreciate, there would be nothing left but memories and a few pictures. To pay homage to the history of bowl riding and the visual esthetics surrounding this punk attitude culture. Ten Contemporary Artists and Pro Skateboarders will Bomb miniature concrete poured skate bowls. These bowls are not Toys, but concrete replicas of a real skate bowl, encased in a custom maple wood stand. Each artist will hand paint their style of art and subject matter. 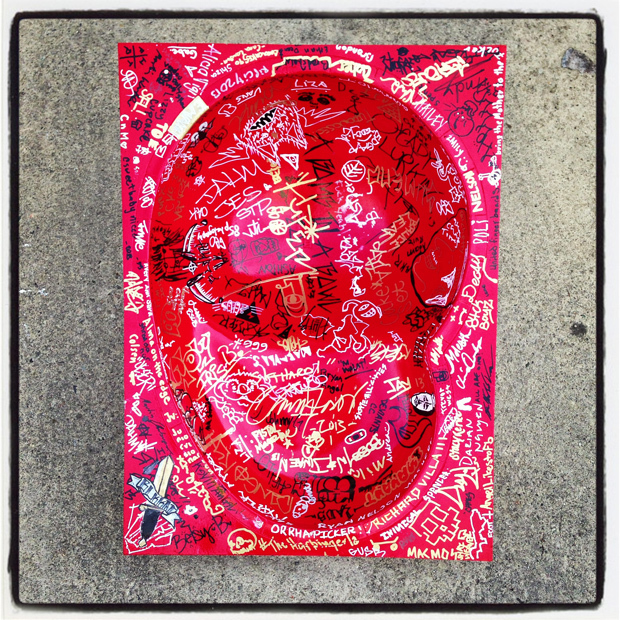 Bombing artists are Tony Alva, Christian Hosoi, Steve Caballero, Jake Brown, Mimi Knoop, RISK, Nathan Ota, Richard Villa III, Esao Andrews, Joshua Petker, Nomad and more. The “Dogbowl” became world famous, as well as the skaters and their groundbreaking sessions. Tony Alva, Jay Adams, Stacy Peralta, Bob Biniak, Paul Constantineau, Wes Humpston, Ray Flores, Jim Muir, Wentzl Ruml, Shogo Kubo, Baby Paul Cullen. Writer, Craig Stecyk & photographer Glen E. Friedman documented most of the sessions, along with “Skateboard World” magazine, they photographed regularly with the Z-boys and have published iconic images that have inspired generations. Whether it is the “Dogbowl”, “The Keyhole” in Beverly Hills, “The Fruitbowl” in Garden Grove, “The Gonzales” bowls. These pools were where the birthplace of innovational moves, like Tony Alva’s “frontside air”, “figure eights”, “forevers”, “wheelers” “hip riding” & shallow end carves. Bowls in general have played an important part in the development of modern skateboarding and still do. They are the playgrounds, battlegrounds the concrete canvases of these creative, adrenaline fueled misfits. Exhibit A Gallery has alway done art exhibitions, simply for the sake of the art. To help promote creativity, to give those with a voice a platform to be heard. Giving opportunities to lesser known artists to be shown side by side with some of the best contemporary artists. A place where all walks of life are welcome, a place for all creatives to congregate.